There are 9 reviews of Poppy. Like tickle you by kiss you to paint a sweet smile on your face.Poppy is a nice blended with the citrus weaved simply through and delicately glazed in marshmallow that is lacks sexuality or flirtatiousness.this scent has been drawing loads of compliments from men.the bottle is pretty.Sweet, Fresh,Youngish,Joyful,Graceful,Cute,Juicy,Smooth, Powdery with Aquatic Side. The opening is fresh and aquatic with cucumber and mandarin but then quickly becomes warm by sweet notes like honey,hugging but still elegant due to a subtle flower composition of lush gardenia and sensuous jasmine while an addictive impression lingers with a layer of creamy marshmallow wrapped in sandalwood and skin vanilla to enjoy having a fun bonding with him and cherish every single moments together.Poppy is fun and so easy to wear great for casual day. At my first try, I really liked the refreshing cucumber notes and the candy notes, and thought that it smelled better than Katy Perry's Purr. After a few wears, I kinda got tired of the scent. It's a sweet yet mediocre scent after all. I found this fragrance to be undescribably nasty, but I'll give it a try. 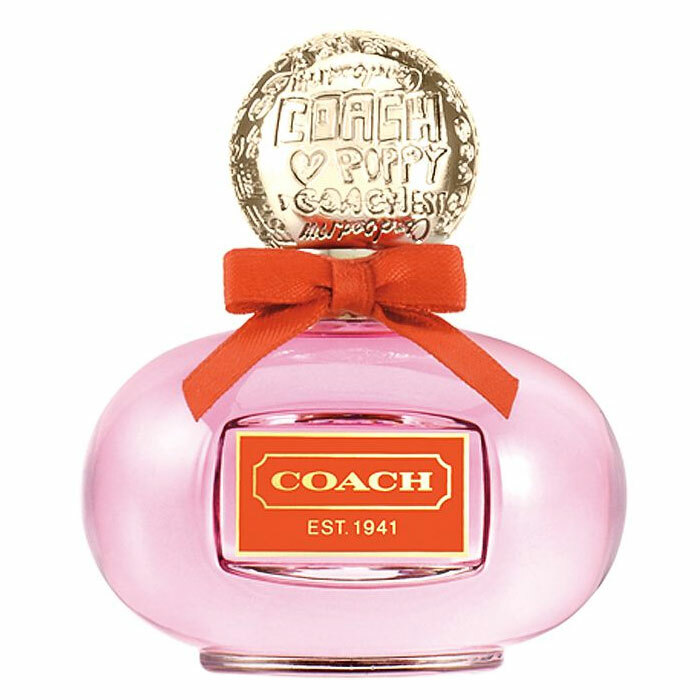 Think of the Juicy Fruit gum we used to chew, add a little more sugar, and make it oppressive, damp, and so sweet you expect it to crystalize on your skin when you spray it on, and you have Coach Poppy. Very sweet on me from top to finish. On the day I sampled this, a friend mistakenly attributed the sillage to fruity bubble gum (& asked if he could have a piece)! I think this smells great, especially for the spring and summer!!! Plan to buy a bottle! Poppy opens up with a watery-sweet amalgamation featuring lily, freesia, and cucumber, the combination of which usually reminds me of various bath products. It is rescued from this by a gourmand undertone like 'dessert berries' -- fruity and a little dense. Watery and dense? Now I see... Coach is trying here to capitalize on the fruity-floral successes of the Princess and Juicy Couture lines, but stumbles a bit in the clumsy delivery. Poppy is competent, strong and lasting, generally well-made, but is noticeably shorter than her contemporaries. Give her a break - She's a nice kid who just wants to be noticed by the popular girls! There are no member images of Poppy yet. Why not be the first?